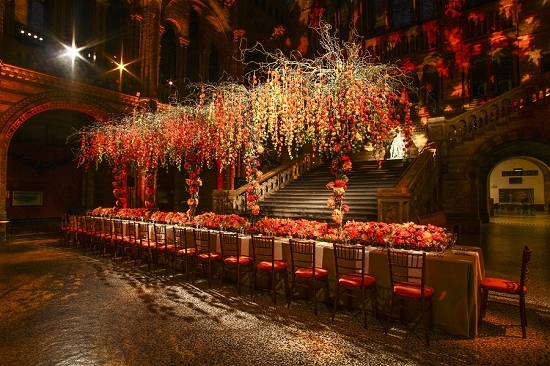 The spectacular image of a banqueting table in the Natural History Museum bathed in orange hues and dripping with physalis encapsulates all that is magnificent about the work of Simon J Lycett, the worthy winners of the Flower Market Award for 'Florist of the Year 2013'. The concept, execution and breath-taking theatricality of the design is trademark Simon Lycett. When you learn that the design was staged in a window of just 40 minutes, you can only marvel at the logistics involved. 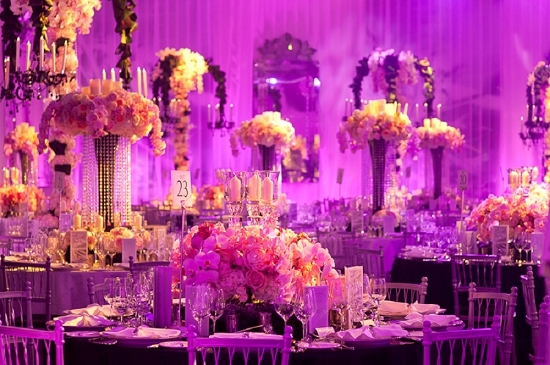 Simon J Lycett Ltd create sensational flowers for the weddings and parties of royals, celebrities, the rich and famous here and across the globe, from the most intimate of dinners for 20 people to large-scale events for up to 1500 guests. They are accredited suppliers to some of the most prestigious – and exacting – buildings in London including The Historic Royal Palaces, The Royal Academy of Arts, The V&A, British Museum, St Paul's Cathedral and the Tate. And every single flower, foliage, plant and prop comes from New Covent Garden Flower Market. So how does a project such as the Natural History Museum quasi-installation develop? "Generally, I come up with a concept, take it through to our work room where the team will come up with prototype. I am lucky to have a fantastic team," says Simon of his 11 full-time, highly experienced staff, and expert freelancers. "We then try and temper our ideas with what can realistically be installed in the time," explains Simon. All the designs have to be created in their workrooms in the railway arches of SE5, and transported to the venue. Once the space is accessible, the team has typically just 40 minutes to complete the installation before the guests arrive. "My team are brilliant with quick, efficient get-ins," Simon adds. You would imagine that the long hours of an event florist must take their toll on the esprit de corps, so looking after his talented team is a top priority for Simon. "We have very regular meetings, and talk about things all the time. The work is enjoyable, and I give them the tools they need, and reward my staff financially as far as I can. I have always felt…we should all share in the success of the company." Simon caught the floristry bug at the tender age of seven, and by 14 he had created his first wedding flowers. A chance visit to the park on an August bank holiday revealed the glories of flowers, plants and floral art at the Warwick Horticultural Show to an impressionable Simon, who was inspired to enter the miniature garden category the following year. He left with the Cup and his mind set on a career in floristry. Today, it is clearly a source of great pride to Simon that young show-goers now compete for the Simon Lycett Cup! Years later, with years of flower shop experience under his belt, Simon clearly remembers walking into New Covent Garden Flower Market for the first time. "I was buying for Robert Day at the time, who was a great rival of Kenneth Turner," relates Simon. "The first person I met was Bobby [Armitt] of Alagar, who was at Charlie Gardiner's stand. We are still dealing with the same guys today, 27 years later!" Simon or his buyer extraordinaire, Julie Thompson, are to be found in the Flower Market by 5am most days. Why do they find the Flower Market so essential to their business? "The problem with many florists is that they are all selling exactly the same products," says Simon. "Buying at Market is quite an easy way to make a difference. You have the pick of the world here. It sounds like a cliché, but you really do. Look around and you come across a quirky little box of something from the other side of the world, things that you will never see again. "You find exciting boxes of English flowers. You see stuff you would never dream of. You spot combinations of flowers that you would never have thought of putting together, but that work. You can never be stale if you buy in the Flower Market." 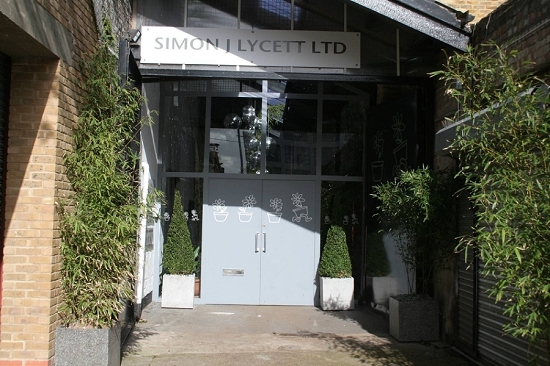 Simon has recently embraced Twitter and tweets photos from the Flower Market almost daily as @SimonLycett. "Tweeting from the Market is a visual feast every day," says Simon. 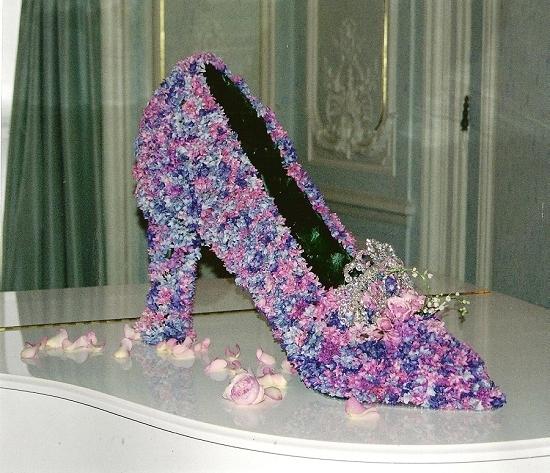 "A florist from Jersey even tweeted that my Tweets had totally inspired her buying from Alagar!" Whether you follow him on Twitter or watch his media appearances, Simon's enthusiasm and love for his work and his flowers are infectious. 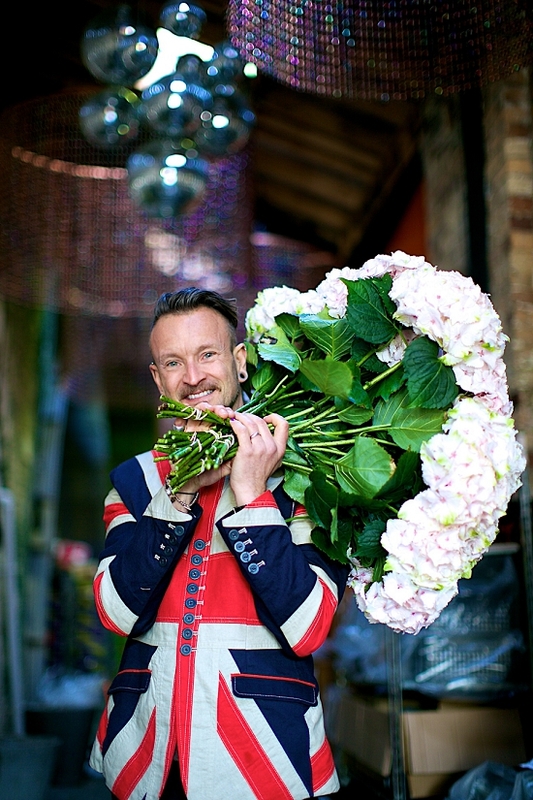 A charismatic communicator and one of the most charming, genuine people you could wish to meet, Simon Lycett is evangelical in singing the praises of British flowers and professional British florists. 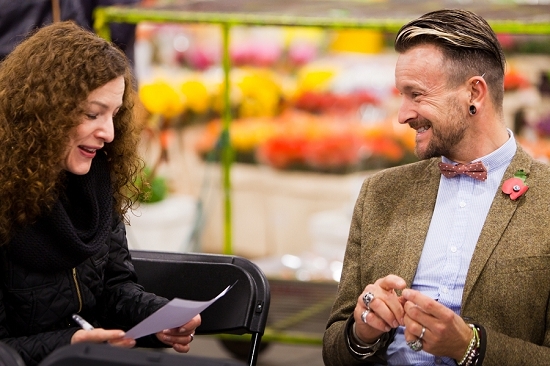 As the media face of floristry, Simon Lycett uses his appearances on the Alan Titchmarsh Show, on BBC Chelsea coverage or at the RHS Careers in Horticulture to raise the profile of British floristry and seasonal flowers. 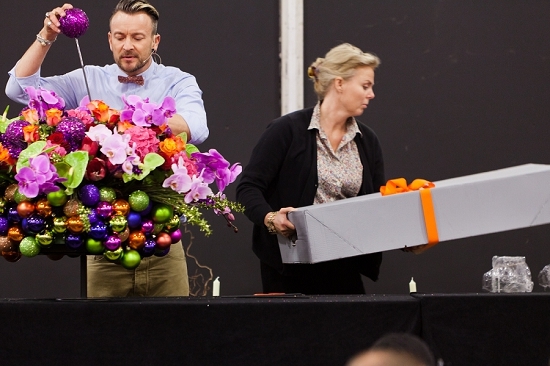 Simon is known for his theatrical floristry demonstration, for which he credits his style to George Smith, the NAFAS demonstrator who took Simon under his wing early in his career. There are audible gasps from the audience as Simon unwraps yet another beribboned grey flower box to reveal yet something more exotic or dramatic to add to his spectacular demonstration pieces! It's about inspiration and showmanship. And that is what Simon J Lycett Ltd does so brilliantly.